Year after year, we see change happen before our eyes. Some of it is good, and some of it is bad. Whether good or bad, we must adapt to these changes in order to not just survive, but to thrive so we can live our lives to the fullest. How an individual deals with change varies, but mostly, we all rely on what we know, our instincts. The more we know about something, the less risk there is, and the better we can make calculated decisions. And in this case, calculated predictions. With that in mind, in the coming weeks I’ll be taking a look at each NHL team featuring 10 of its players. Are they destined to rise or destined to fall? That will be answered below. G – Frederik Andersen (rising): When Viktor Fasth started on injured reserve for the 2013-2014 season, it was Andersen who stepped in for the Ducks going 20-5-0 on the season. With Fasth and Jonas Hiller now moving on to darker pastures (Edmonton Oilers and Calgary Flames), and with the age and experience advantage on Gibson (which is not a lot) it’s now Andersen’s job to lose. D – Cam Fowler (rising): From a point-perspective, had it not been for the injury, it was looking like a career-year for the young blue-liner. While it has taken Fowler a few years to settle into a top-4 role, he was arguably Anaheim’s best defenseman last year. Look for Fowler to expand on last year’s play and establish himself as a true franchise defenseman. 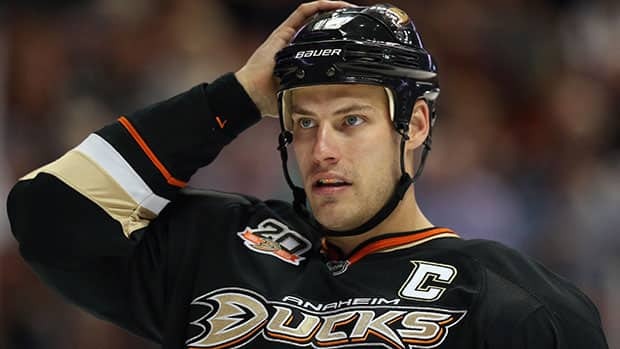 C – Ryan Getzlaf (neutral): Last NHL season, Getzlaf was nominated for the “Hart Trophy” after posting 87 points, good for most in the league after Sidney Crosby. Getzlaf will reach the three-decade mark in 2015, but his best years of hockey are far from over. Expect similar numbers from the Regina native. G – John Gibson (rising): Gibson made his NHL debut on April 7th versus the Vancouver Canucks, shutting them out 3-0. Gibson has been considered the league’s top goalie prospect for quite some time, and the world finally got to see why that is. If the Ducks don’t sign a backup, expect Gibson to give Andersen a run for his money at the #1 gig. C – Ryan Kesler (rising): At the trade deadline last year, Kesler requested to be traded, but it did not happen. However, he later got his wish when he was sent to the Ducks at the draft for Nick Bonino, Luca Sbisa, and a 1st round pick (24th overall – Jared McCann). Aside from Getzlaf and Perry, Kesler is the best forward to play for the Ducks since the Ottawa Senators’ Bobby Ryan. Look for the change of scenery to the cup-contending Ducks bring new life to the truculent center. D – Hampus Lindholm (neutral): Hampus Lindholm may have been Anaheim’s brightest surprise last year posting 30 points in 78 games played. Going into only his 2nd season next year, to top what he did would be difficult, even for the former 2012 6th overall pick. Expect similar numbers from the sophomore. RW – Kyle Palmieri (rising): Refer to Jakob Silfverberg. RW – Corey Perry (neutral): It has been 3 years since Perry’s 50-goal, 98-point season, and his numbers have been all over the place, 60, 36 (in 44 games played), and 82 points respectively. Given how close the Ducks were to reaching the Stanley Cup Finals last season, expect Perry to remain as one of the league’s top scorers for 2014-2015. LW – Jakob Silfverberg (rising): Of Bonino’s 49 points last season, 24 of them were on the power play. Why is this relevant? For the better portion of last year, the two were line mates on the second line, but rarely outside of 5-on-5 play. This brings up the question how just how effective Bonino is in 5-on-5. With Bonino out, and Kesler in, as well as another year under the Swede’s belt, look for Silfverberg to break out next year as a true top-6 winger. D Francois Beauchemin (falling): With youngsters Cam Fowler, Hampus Lindholm, and Sami Vatanen on the rise, Beauchemin will not be needed to provide the offense he used to. C/LW Andrew Cogliano (neutral): He’s got speed to burn, and a defensive-game the Ducks have leaned on heavily, since his early days in Anaheim. For that reason, he’s a likely stay on their 3rd line. LW/RW Emerson Etem (rising): With Selanne announcing his retirement, Koivu not resigned, Winnik and Perreault signing with other teams (Toronto and Winnipeg), the Ducks obviously feel Etem is ready for a more prominent role. LW Dany Heatley (rising): Signing a 1-year deal worth $1 million, the Ducks won’t hesitate to bury him in the minors if he doesn’t play up to snuff. But before they do that, many people believe he will be given a shot at the top line gig, alongside stars Corey Perry and Ryan Getzlaf. Sounds like cash money to me. LW Patrick Maroon (neutral): With the acquisition of Heatley, Maroon’s value seems likely to take a hit, primarily skating alongside Getzlaf and Perry last year. But after being resigned to a 3-year deal worth $6 million, he’s got money on his side, and the Heatley experiment is just that, an experiment.